In earlier blog post I explained how to create user account on-premises and accompanying Mailboxes in Office 365. This is possible with or without an Exchange server on-premises. The latter works, but it’s not supported. There are also scenarios where you have cloud identities in Office 365 that you want to connect to user accounts in an on-premises Active Directory, so basically converting the cloud identity to a synced identity. This is a common scenario for example when moving from one tenant in Office 365 to another tenant, of maybe when moving from Groupwise or Notes to Office 365. 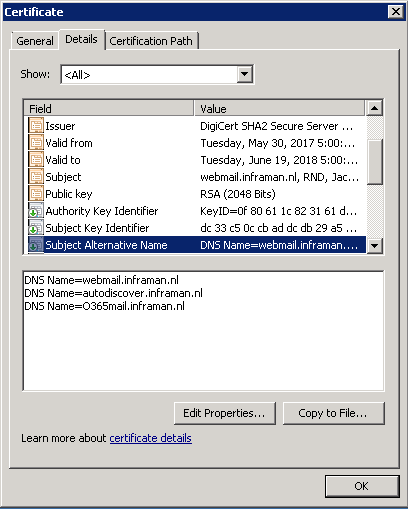 Suppose we have a cloud identity in Office 365 for a user named Chong Kim, he has an E3 license, a username ckim@exchangelabs.nl and this is also his primary SMTP address. 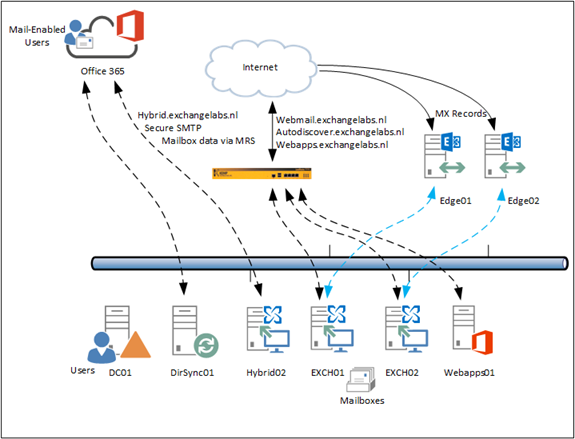 After building a hybrid Exchange environment as outlined in a couple of previous blog posts we have an Exchange 2013/2016 environment where some Mailboxes exist on-premises and some Mailboxes exist in Exchange Online. Autodiscover is still pointing to the on-premises environment, and so are the MX records. 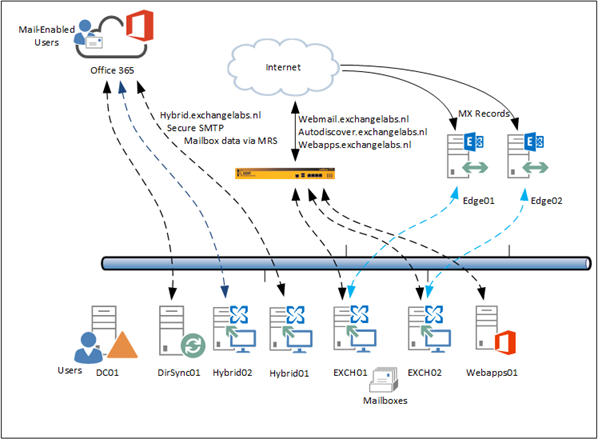 Inbound SMTP mail flow from the Internet is still accessing the on-premises Exchange 2016 Edge Transport servers before being delivered to the intended recipients. Figure 1. The Exchange hybrid environment with Mailboxes on-premises and in Exchange online. Customer is running a web application and this web application is able to send SMTP messages, for example after a new user registration or a ‘forgot my password’ option that sends out a link for resetting a password. Service not available, closing transmission channel. The server response was: 4.3.2 The maximum number of concurrent connections has exceeded a limit, closing transmission channel.